My final words is that a visor may be showed for the Wii, you will say wow at the graphics. The visuals you will see will be as good as xbox 360, and may even beat PS3 graphics. The Wii can display visuals in standard and sterescopic 3d defintion mode. Wii will be the Home Entertainment system like the NES was the Nintendo Entertainment System. It will feature stereoscopic 3d movies and games via a built in stereoscopic 3d projector which fits in the mystery bay under the dvd slot of the Wii. Nintendo will win the e3 show and it would give the fans the ultimate video game experience ever in the history of video gaming. I am not seeking attention, i am not trying to play with you or fool you in anyway. I also admit that i am just a kid who is 14 years old, i have a lot of time on my hands. But i get my information from my brother who works in a specialized industry i won't say the kind of industry. It's simple my brother the professional has inside info on the Nintendo Revolution. He wanted a blog to be made that wouldn't cause much hype, infact not even hype, just a place where it could hold some secrets of Nintendo's next generation console that he knows about. He didn't want to write this blog himself as if he wrote it then it would look very professional because of his very good english writing skills. So he got me to write as both myself and my brother knows that my writng is pretty crappy, as in my grammar is awful. He knew that if i was to write it people who came to the blog to read it would think 'oh this is just some kids dream' sucking and fooling people. But like i said this is how it's been done, my brother gives me the information that is real and i write it in my crappy english style for you to read, but 50 percent is fake and 50 percent is real. What i get out of this is some cash for helping my brother out. A virtual reality head mounted display has 2 screens which are stereoscopic and each screen has an independent view, which is a different image in which when viewed your eyes adjust and your brain displays the image as one in true 3d space. This is how true stereoscopic 3D works. And how it gives you amazing depth and depth of view. Now for the true expereince of virtual relaity it is best to use a head tracker so that you can turn your head in any direction and the game world your viewing will change with you, in order to do this you need the head tracker, now a head tracker uses the x, y, and z axis. Now the secret that all you people haven't realised is that the x, y and z have been displayed on the revolution controller which just shows that this is no conicnidence. The rev remote can track virtual space in any direction, it uses a head tracker with 6 or even i think 8 degrees of freedom, now just to get some of those freedoms you will be working on the x, y and z axis. So what nntendo have done is left clues in the images of ign in the reflection, ign know more than what there saying. "Were going to add one more number to the mix and that number is two"
Now two is referring to two screens of the visor, and also nintendo told ign that when they were to write up an article at the TGS 2005 about the rev remote that they should put in a refeletion where the controls buttons don't match as this will add to the mystery. And that mystery is that the reflections are to show you that the revmote which is above the reflecion displaying the a and b buttons are the one true display and the reflection underneath the original is the x and y buttons that refer to the out of sync dispaly which is the independent view of the visor. And also as there dispalying these button arrangemtnes in the revmmote it shows that they are also referring to head tracking as the revmote uses a tracking that's based on x, y and z axis. ign and nintendo are working together to play the game with us, and obviously nintendo needs ign on their side as nintnedo needs somneone to get their information written out for all the world to see, as ign are good at leaving clues and have uniqe writing stlyes is just what nintendo needs for them to help promote a system through the net without nintendo themselves having to do much work to promote their console. Your obviously thinking i am a complete fake. Well i am in a way, i will be honest i don't work for Nintendo. I was just giving Nintendo fans hope, but i will say that 50 percent of my blog is bull crap and the other 5o percent is real. I do know some developers which are working on Nintendo games which is how i get my information. I am Japanese but have lived for most of my life in Spain. As my posts started off they were very interesting in my opinion and more to do with the 50 percent real issue. But as they went on i wanted things too look fake to you people, i never wanted this blog to turn into a blog like seriousgamer007 's. I thought with my blog i could keep a low profile and not reveal too much. Which is also why later on i started writing outrageous updates to do with that controller pic i posted as i wanted this to come to an end. But why do i wait till now to post you ask? Well i believe you people know that there is some truth to this blog, the only way i can prove to you people that i have connections is that i got the controller right, not the one with the pic that was just a fake to steer you away from my blog before TGS. 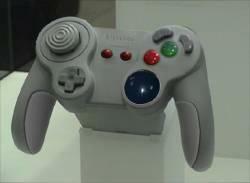 You need to look at my first post ever on this blog which was months before Nintendo's controller unveiling at TGS. I mentioned it's a 2 piece controller which can understand 3d motion in real time. If you don't believe me then go and check the date of that post. go on. I just described the controller differently as i did not want to draw too much attention. I didn't wan't to say that it's really a remote controller with nunchuck attachment because there could be people really out there that thought it really is this and especially Nintendo would of made sure they found the developer who leaked it to me and fired him. So i addressed the controller as some what of a glove that you put around your wrists. So you see i do have the know how, and the connections in this business so this is the proof you need to show that i am the real deal. leave me a set of questions in the comments box with your contact details and i will be happy to send you a reply with the answered questions. Or if your not happy posting your contact details i will answer your questions directly on this blog. I didn't want to post this on the main page as to not cause much attention, i need to keep low and not reveal so much so i became an anymous poster and put the link in the comments box of my previous post quite a while ago, go and check it out for your self. I just wanted to verify to you people that this image has circulated the net in the last 24 hours, someone must of taken it from my blog and posted it everwhere and claiming they work for Nintendo so whoever you are you stole this from me. I guess i should of never posted it in the comments box and if you think i am lying then go and check my last post and the second comment and you will find the link of the image has been there for a few days now and that's way before this image has circulated the net. So you see i am not fake and that is the real revolution controller, not the revolution revolution but it is one of the controllers. It may be a final design but not so sure on that one so i will check that out from within these offices at Nintendo. In one of the hardware listers i mentioned Siemens, people ask why Siemens? what have they got to do with the revolution? Siemens plays a huge goal with Nintendo, ever since 2000 they have been preapring something really BIG for you the fans and newcomers to our next generation of hardware supremacy. Siemens came out of nowhere with this head visor, when in 2001 the global player was introduced everyone at this conference were in awe when they had a play with this visor. They couldn't believe that for that generation you were able to have an immersive dispaly which was light weight and had 360 degree headtracking coupled with a wirelss box that would send the video data to the display without any lag. This unfortunantely was never released into the military and industrial sector as we snapped it up and have been working ever since with Siemens to create the most appealing HMD (head mounted display) in the world which is afforadable, immersive and yes it is the ON. I have a pic below for you to look at, it is known as the siemens global player aka version 1 of the ON, the ON has come along way now and even has better optics than the leaked ON clip. and it has done for many many years, why! well obviously to work on the ON why else. Your probably thinking but hey the big names have said we not going to support revolution, well really what's happend is that we have got all the big developers to sign NDA's, but there are a lot of third party developers that have been developing for many months now, to make games on the revolution is a lot quicker than any other console, we can cut development time in half compared to any of the competetion. All of the above games are going to be truly superb and unique and for the first time in gaming history you will find on launch a huge amount of games where you would want to own every single one. It is not 52, 32, or 22 but the mystery number is 101555101 can you tell?